Hello my lovelies, and happy new year! It's been a short while since my last post, as I took a little break from blogging and social media over Christmas. I was lucky enough to have the entire Christmas week off (for the first time ever since starting my job! ), and I've been trying to get back into the swing of things, including everything blogging-related. 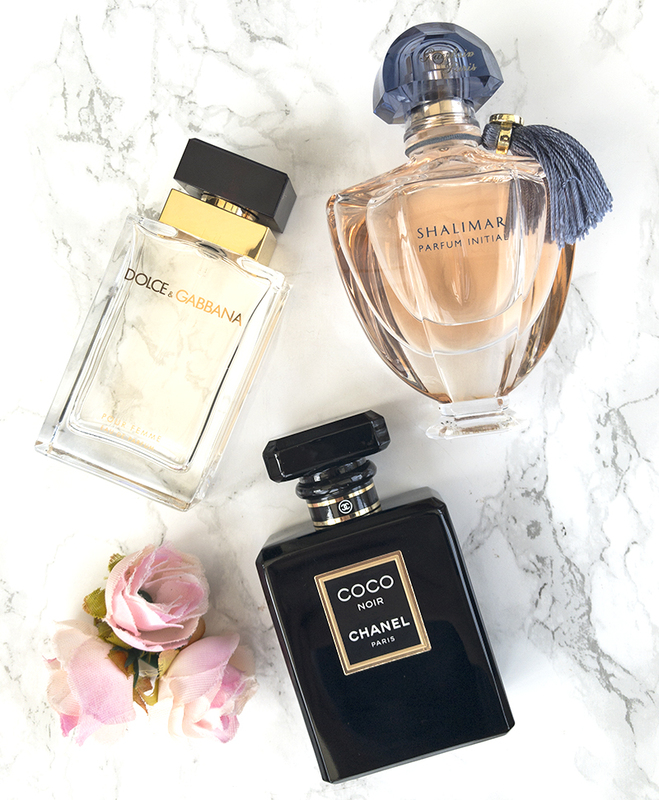 Today, I am very excited to be bringing you the very first post of 2018, which is all about the best perfumes to wear this winter. I think that winter is the perfect time of year to enjoy fragrances that are quite dark, intense and sweet. My favourite winter perfume notes include earthy patchouli, caramel, marshmallow and iris; all of which will feature in today's list. Hope you enjoy! If you want to treat yourself to something really special, I'd suggest one of these three high-end designer fragrances. Chanel's Coco Noir (£70 for 50ml) is a scent that always seems to make its way back into my recommendations; and honestly, I could not imagine this list without it. Coco Noir is edgy, yet classy; powerful and feminine. It smells quite spicy and floral, with some woodsy undertones and lots of earthy patchouli. If you enjoy the original Coco Mademoiselle, this will be a good one to try - it's just like a darker, sexier, more grown-up version. Perfect if you're looking for an elegant night-time scent that's going to attract lots of attention and compliments. If you are after something a little more casual, I'd recommend Pour Femme by Dolce & Gabbana (£45 for 50ml). This perfume is absolutely hypnotising and perfect for winter! It smells just like sweet marshmallow clouds, with a hint of fresh raspberry. Typically, I'd associate the scent of marshmallows with something that's quite heavy, sugary and artificial, but honestly - Pour Femme is the most grown-up marshmallow you will ever smell. Whilst very sweet, this is definitely not a generic sugary bomb; this fragrance is luxurious, sophisticated and quite intimate. Finally, my third luxurious perfume recommendation is the gorgeous Shalimar Parfum Initial by Guerlain (£50 for 60ml). This is a more modern, youthful interpretation of the original Shalimar fragrance from 1925. The bottle is absolutely stunning - tall, sleek; decorated with a pretty blue tassel and a few golden accents. The scent itself makes me think of iris flowers, caramel and expensive lipstick. It's powdery, classic, exotic and a little unusual. A lovely pick if you're after something very elegant and sophisticated, but I'd definitely recommend testing it before you buy as it's quite bold and likely not for everyone. 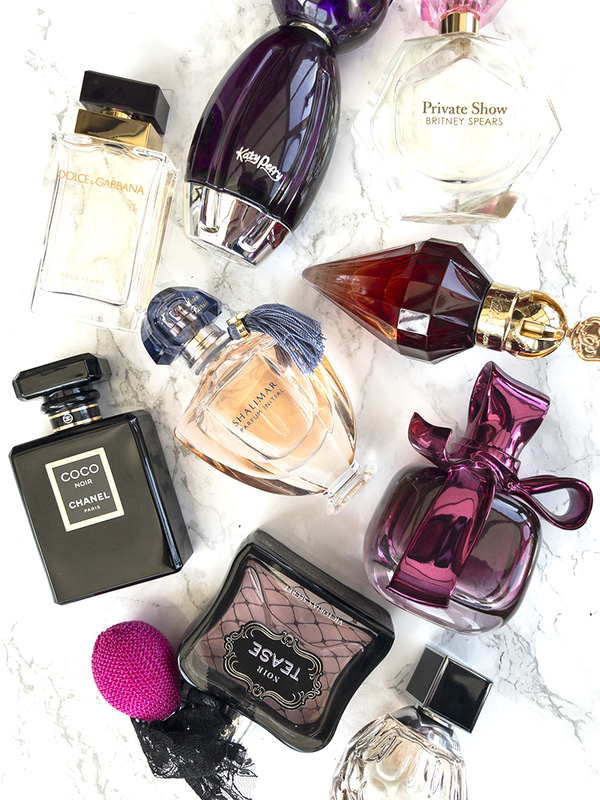 I love celebrity perfumes as they are fun, affordable and for the most part, very easy to wear and enjoy! 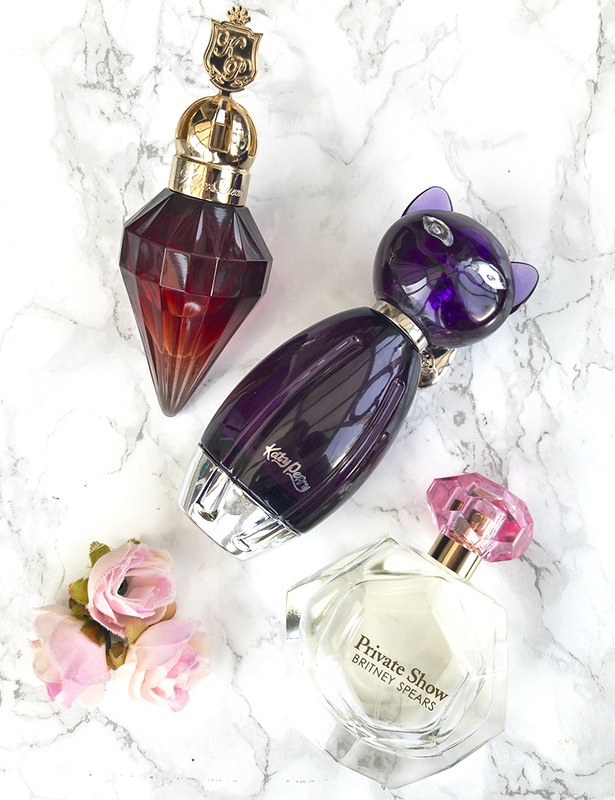 Amongst my favourites for winter is the Killer Queen by Katy Perry (£12 for 30ml), which is a great dupe for Lancome's La Vie Est Belle. The two share similar sugary-fruity notes; with sweet nuances of praline, vanilla and juicy blackcurrant. It's a simple scent, but there is something very warm and comforting about it, making it a great pick for those colder months. Another winter favourite is Katy Perry's Purr (£12 for 100ml) (I am by no means a Katy Perry fan, but I do think that she makes wonderful fragrances!) - whilst I am not a huge fan of the bottle, the fragrance is one of my main go-to's for winter and I'd wholeheartedly recommend it to everyone. Purr is girly, but not juvenile; it's sweet, but not overwhelmingly sugary. It smells fruity from the peach, milky from the coconut; softened with sweet jasmine, and strengthened with dark sandalwood. There is also a bamboo note that's quite exotic, and very prominent throughout the composition. Last, but definitely not least, we have Britney Spears' Private Show (£15 for 50ml) - a delicious, warm fragrance that makes me think of a Starbucks frappuccino. It's sweet, soft and comforting; with notes of coffee, whipped cream and dulce de leche (basically, creamy caramel sauce - yummy!). Coffee is definitely an interesting note, and one that you don't see (or smell!) very often. However, it doesn't smell dark or bitter, like typical coffee - instead, it's very creamy and warm. This is a lovely perfume for colder months - it's utterly delicious and smells much more high-end and expensive than it actually is. If you want to treat yourself to something special, but without spending a fortune, I'd suggest one of these mid-range designer perfumes. Victoria's Secret Noir Tease (£35 for 50ml) is warm, sweet and comforting scent; combining delicate notes of vanilla, praline and juicy pear. To be honest, to me, this perfume smells exactly like chewy caramel sweets. If you're familiar with Juicy Couture's Viva La Juicy - Noir Tease is almost identical, but a little more on the fruity side. Aside from the gorgeous scent, I think that this one would be worth buying just for the bottle - the little pink pump is so adorable! If you are after something a little less sweet and more on the spicy side, I'd recommend Ricci Ricci by Nina Ricci (£30 for 50ml). This perfume is elegant, mysterious and perfect for winter! It smells feminine, floral and very 'purple', with a prominent rhubarb note that isn't commonly used in fragrances. There are also delicate hints of earthy patchouli and sandalwood lingering in the background, making this an especially memorable, mysterious and almost intimate composition. Finally, my last mid-range designer recommendation is the lovely Jimmy Choo by Jimmy Choo (£29 for 40ml). This perfume used to be especially popular a few years back, and I'm sure that many of you are already familiar with it. This scent is sweet and delicious, but there is also something a little tropical about it. Toffee (yummy!) is definitely the main note here, surrounded by a colourful palette of pear, patchouli and vanilla accords. Patchouli especially is very interesting, and gives the overall fragrance an unusual, slightly dark edge. I'd wholeheartedly recommend this if you're looking for a versatile, warm winter scent with a hint of something a little unusual! What perfumes have you been enjoying this winter?